When’s the last time all three podium finishers were all of the same nationality? When’s the last time four different constructors won the first four races of the season? Where do you go for the right question to ask – and have the answer to – as an F1 record’s being broken live? For the answer to the first two questions, keep reading below – and for the answer to the third, meet Sean Kelly – a man who’s written his own job description in Formula 1. 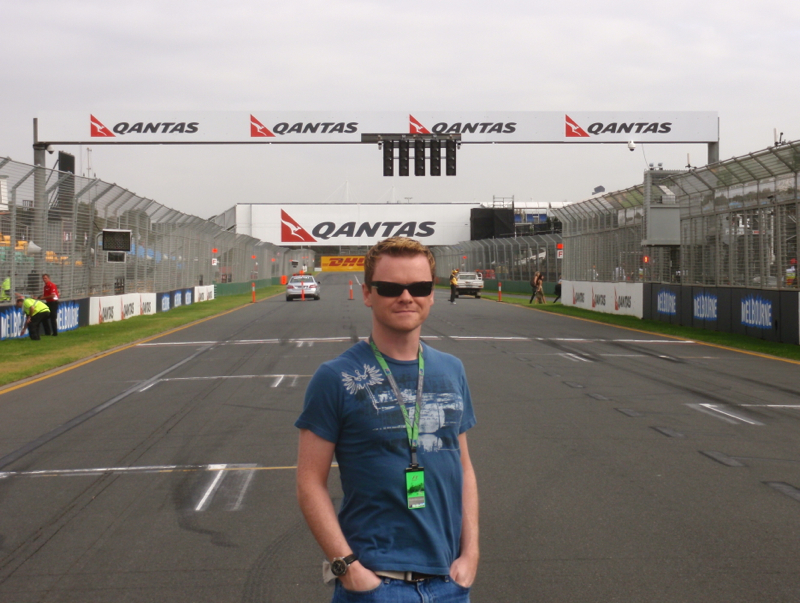 As a member of SPEED’s research team and F1 statistician, Sean specializes in compiling and studying the reams of F1 statistics and data leading up to a grand prix weekend, then looking for potentially record setting and statistically significant events that broadcasters can turn to as part of their programming. I met with Sean just before the season opener in San Diego down at Henry’s Pub, a local F1 institution on Sunday mornings, and got a glimpse of exactly what goes into the work he produces at his firm, Virtual Statman, and how that shapes our experience of race broadcasts. It should be said that it helps having the ability to totally recall races, dates, winners and pole sitters for every GP, but a lot of thought has gone into the final product as well. Sean’s demonstrated his ability soon after we met, and he can put together a story of facts and stats just looking at a photograph or outline of a car, remembering testing locations, liveries, and drivers. And he’s only missed 2 races in the past 25 seasons – not bad for a guy in his early 30’s. “My first race was in 1987, when I was 6, my brother turned on the Brazilian Grand Prix at home, I just sat and watched – and have been following ever since.” Starting in the early 2000s, he got the idea for this sort of service when he approached SPEED about an idea – one “that would forever change how the sport was covered” – he laughs now when recalling the shot he took by leaving a voicemail with SPEED’s F1 producer Frank Wilson. 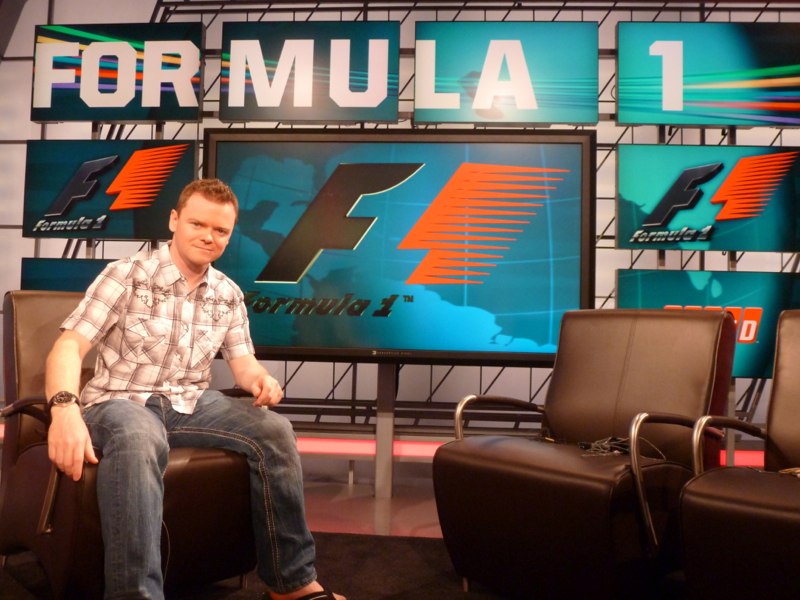 When he’s not compiling the latest data, covering the sport at the F1 circuits or in Charlotte with the SPEED team, Sean’s supporting Liverpool FC or playing the drums – give him a shout out on twitter @virtualstatman and stay tuned for more of his insights next race with more stats and facts as the season heats up. It’s rare to hear team bosses speak out candidly on a range of issues in regards to the need for change in F1, and in this series of ongoing interviews with McLaren boss Martin Whitmarsh, SPEED journalist Peter Windsor has recorded multi part videos in which he and Martin talk about topics from the state of Formula 1 to it’s arrival back to the United States in 2012. As McLaren prepares to launch an automotive brand here in the US, their need for success in this important market is understandable. While not all teams will be leveraging F1 as a platform for their own brand in such a direct way, each faces similar challenges in creating and innovating value for their sponsors and partners who will be paying for the exposure F1 brings here and across the world. As the global championship is shifting from Europe to new markets, so is the way in which F1 is experienced around the world by its 600 million fans. In this segment, the evolution of the sport’s audience in a new age of technology opportunity highlights the need for FOM and teams to address a new approach to F1’s exposure. Fans and the ‘F1 show’ are discussed in the first half of this segment, and the need to keep pushing to make the sport more accessible for fans. Purists and new fans to the sport may disagree, but DRS, KERS and Pirelli’s tires have each played a part in adding to the show. Finally, Whitmarsh reflects on the 2011 season and talks about team changes – included here to round out the series. Thanks to Peter Windsor for the timely interview, looking forward to seeing how McLaren and the rest of the F1 field continues in 2012. The British GP was the third of four races this season broadcast on Fox television in the US, the first of which was a marathon Canadian Grand Prix, and at over four hours, the longest ever. During that race, I was able to follow from a number of different people tweeting during the red flags that FOX did not break programming from the race, showing the entire four hours. This was definitely an improvement from earlier years when FOX would publish an F1 race in their schedule, and then abandon fans with local baseball game coverage instead. Following an amazing race yesterday, Formula 1 fans in the US were happy to see the start of what should have been a compelling set of interviews from race winner Alonso as well as from the 2nd and 3rd place finishers Vettel and Webber. While fans heard from the winner, it was Webber and Vettel many would have liked to hear a few words from, but FOX ended the broadcast before we could ever hear from them. With Alonso’s win clocking in at just under 1.5 hours, it seems natural that there would have been plenty of time in the shadow of the four hour Canadian Grand Prix to show the two Red Bull teammates interviews, of particular interest to Formula 1 fans after hearing their team principal’s radio call to Webber in the closing laps to maintain his gap to second place finisher Vettel. Unlike yesterday’s Red Bull team orders broadcast over the world for race fans to hear, television contracts are not matters of public record. Certainly in this weekend’s race, whatever event FOX was obligated to show as part of their F1 broadcast on Sunday clearly hadn’t ended in American Formula 1 fans’ minds until all three podium finishers had been shown to give their account of the race events during those interviews. Events like this are not uncommon, and in 2005, UK broadcaster ITV was called out by race viewers on an advertising break during the climactic moments of the San Marino Grand Prix, documented here on page 6 of the Office of Communications (OFCOM)website. Breaks may be taken during intermissions of the particular sport being televised ­ eg, half time, between races, between innings, etc. In live coverage of long continuous events breaks may be taken at points where the focus of coverage shifts from one point to another of the event ­ eg, after a resume of the current placings in a race and before refocusing on a particular section of the race. Breaks may also be taken adjacent to cut-away discussion or background film insert sequences. Where edited recorded sport programmes are shown, break points should be selected to avoid creating the impression that some part of the event ­ eg, a round in a boxing match ­ has been omitted to accommodate advertising. Sounds basic enough – and yesterday’s race had been shown in full for the most part – but as Formula 1 fans in the US, what do we feel is a fair broadcast, and when do we feel the event is over? Is it after the checkered flag drops and the winner crosses the finish line, or is it after the driver interviews? In a sport dominated by technology, isn’t it still still about the human drama that makes Formula 1 so compelling?